When the Nokia Lumia 920 came out a few months ago it won praise for the excellent camera, high-quality display and the ever improving Windows Phone operating system. The biggest problem was weight, with the Lumia 920 coming in at an eye-popping 185 grams. So, Nokia have taken the 920 and have re-engineered it to come up with the new Nokia Lumia 925.. and the first thing to notice is that the weight has dropped 25% to just 139 grams and the whole unit is about 2mm thinner at 8.5mm thick. 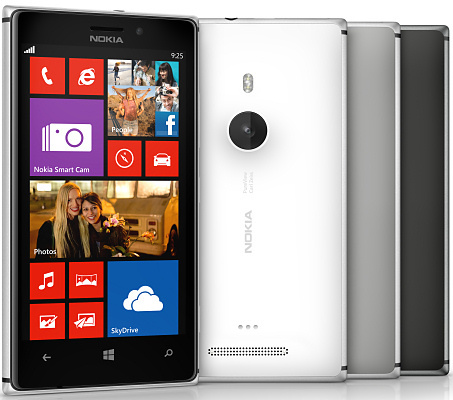 The frame of the Lumia 925 is made from aluminium, and the polycarbonate backs are interchangeable. The weight savings come with a few compromises though. The first one is that the Lumia 925 does not support wireless charging as standard, but you have to use an optional accessory cover for this. More seriously, the standard internal storage has halved from an impressive 32GB to a more modest 16GB, an issue compounded by the lack of a microSD slot, although 7GB of online SkyDrive storage is included. However, Vodafone say that they will be stocking an exclusive 32GB version of the phone, so perhaps there is some hope here. One of the headline features of the 920 was the optical image stabilisation, and this has been retained in the Lumia 925. The 8.7 megapixel primary camera also comes with a number of new tricks in software plus a dual LED flash and 1080p HD video shooting capabilities. On the front is a 1.2 megapixel wide angle camera for video calling and self-portraits. The display remains as a 4.5" 768 x 1280 pixel panel, although the Lumia 925 uses an AMOLED display rather than the IPS LCD of the 920. 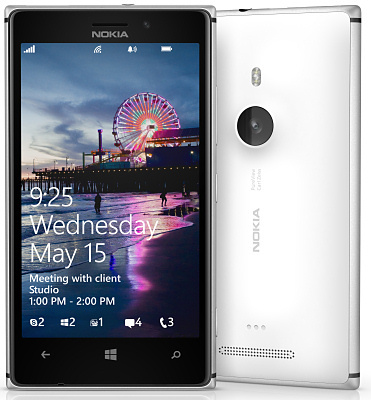 It is slightly curved and features a Gorilla Glass front with Nokia's ClearBlack technology. The display can also be used while wearing a glove or with a fingernail. This is an LTE-capable phone supporting several different bands, and also HSPA+ as well as all common WiFi bands. The Lumia 925 supports Bluetooth 3.0, USB 2.0 and NFC connectivity plus GPS and GLONASS positioning systems. Inside is a 2000 mAh battery which is quoted as giving up to 12 hours talktime and 18 days standby time - in our real-world experience the 920 easily lasts a day on one charge, and we would expect the 925 to be no different. The CPU is the same dual-core 1.5GHz processor coupled with 1GB of RAM as found in the 920. The Lumia 925 includes an FM radio, and rather surprisingly it seems that many other recent Lumia handsets do as well, although it is disabled. An upcoming software update should unlock the radio, which will be an unexpected surprise for many existing users. 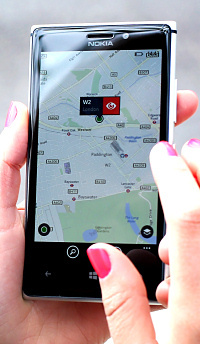 Nokia's HERE Maps provides full-blown offline mapping, and there are a number of other Nokia enhancements to the Windows Phone 8 operating system. The Lumia 925 will do almost everything that every other smartphone will do, but the range of applications is more limited than Android or iOS. The Nokia Lumia 925 looks like a promising device, especially if you can coax the 32GB version out of your carrier. Nokia say that the 925 should retail for about €469 before tax and subsidies and will be available on several carriers and networks worldwide from June 2013 onwards.